Texas streams and rivers support diverse ecosystems that are dependent upon the size and flow of water. The healthiest streams and rivers are those with the least altered natural processes. 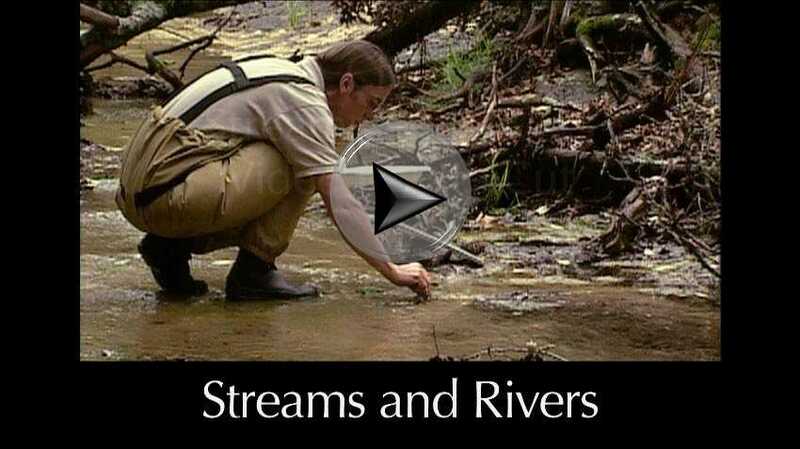 What are the parts of a stream? How do they function together? What is the riparian zone? Why is it important to have plenty of plants growing alongside a stream? What is the floodplain? 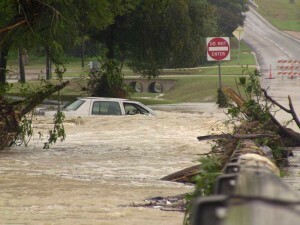 Are floods natural disasters? What is stream order? How can it help us understand the aquatic community living in a particular place? What can the presence or absence of aquatic invertebrates tell us about the health of a stream? How are plants and animals adapted to living in flowing water? How can rivers and streams be kept healthy? How are healthy streams valuable to people? Streams and rivers contain flowing water. The word “stream” can be used to describe all flowing natural waters. Water flow in streams is called stream flow. The word “river” usually refers to a large stream. Texas has 15 major river basins and over 3,700 named streams (see Chapter 3, Fig. 3.2). If you lined up all the streams and rivers in Texas end to end, they would flow over over 191,000 miles distance. Most rivers begin within the state and all empty into the Gulf of Mexico. Rivers form several of our borders. The Red River forms the border between Texas and neighboring states to the north. The Sabine River forms our border with Louisiana to the east. The Rio Grande forms our border with Mexico in the south and west. It is the second longest river in the US. 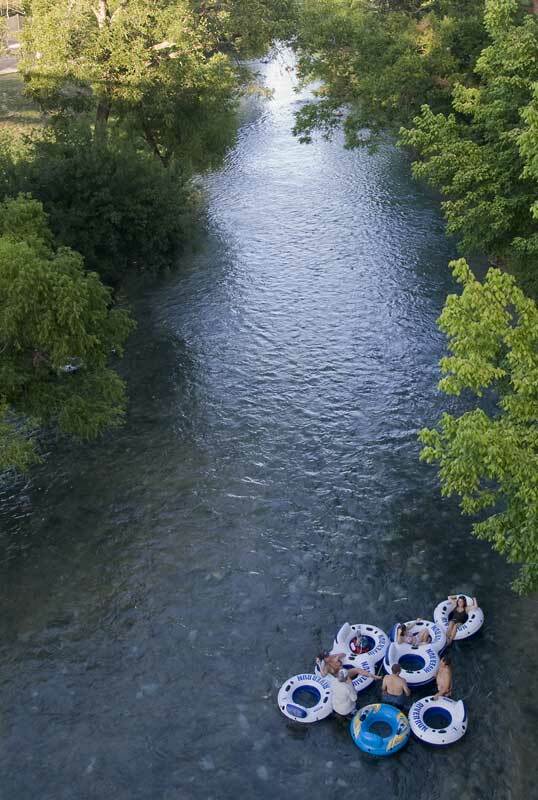 The characteristics of Texas’ rivers differ from beginning to end because they flow through several natural physiographic regions. (see Chapter 3, Fig. 3.3) These regions have different types of bedrock, soil, elevation, weather, vegetation, and land use. This directly affects the shape, length, flow, plants, animals, water quality, and streambed composition of the rivers that run through it. Although stream flow in some Texas rivers is fed by springs, most of the water entering streams comes from runoff of rain falling on land in the watershed. Some streams and rivers may also receive large amounts of water from a city wastewater treatment facility. The amount of rainfall an area receives has a great influence on the size and flow of a stream, which in turn has a great influence on the kind of aquatic ecosystems found in it. Rainfall varies from over 50 inches per year in East Texas to less than 10 inches per year in the west. (see Chapter 2, Fig. 2.2) In some areas, Texas streams stop flowing and dry up because of too little rainfall or due to human uses of stream water. Streams that naturally dry up during periods of low rainfall are called ephemeral. Regardless of their size, shape, or location, all healthy Texas streams and rivers share a common feature — they support diverse ecosystems. The plants and animals living in them exist in balance with the processes that recycle nutrients and other aquatic resources essential for life in aquatic communities. When most people think of a stream, they’re usually thinking of the stream channel. (Fig. 8.1) The channel is the deep part of the stream where water collects to flow downstream. Stream channels always run downhill. In a straight stretch of stream, the main force of the current is in the middle. The deepest water is also usually in the middle. The part near the shore is usually the shallowest. When there is a sharp curve in the river, the strongest current and deepest water moves to the outside edge of the curve. In flowing water, there is less current near the bottom. Areas where the stream flow slows and water depth increases are called pools. 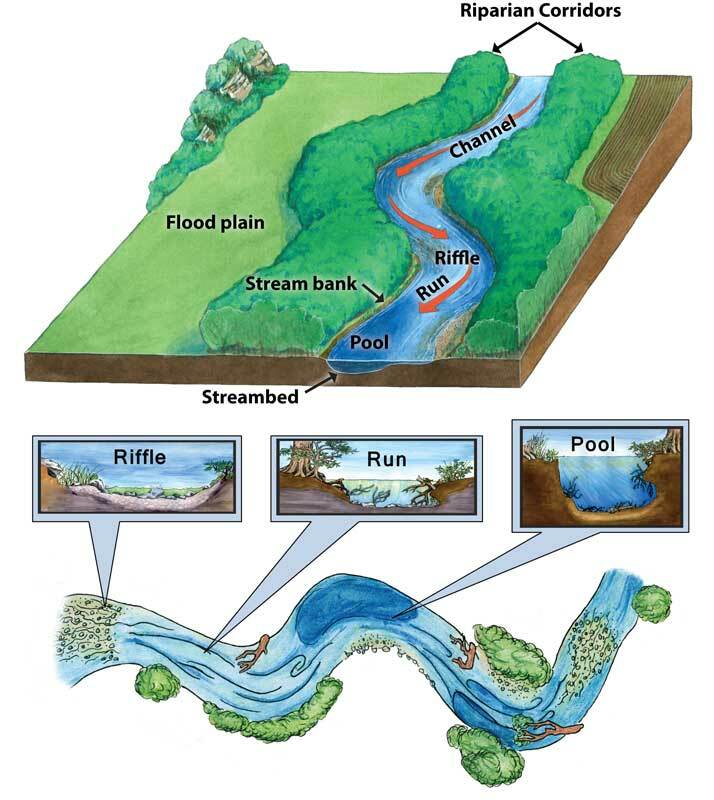 Shallower, faster-flowing stream areas are called riffles. These areas can usually be identified by looking for small waves seen on the surface. The fast moving water between riffle areas and pools is called a run. Rapids may form where the water flows downhill very fast and pushes up against underwater obstacles. Rapids are where you see very turbulent water flow. In naturally flowing streams it’s common to see riffle-run-pool-run-riffle sequences. Alternating slow and fast moving waters make great homes for aquatic life. The channel is only one part of the stream. The stream banks are the shoulder-like sides of the stream channel. Stable stream banks have plants growing on them. The roots hold soil in place and minimize stream bank erosion. When a stream bank erodes, it can cover the stream’s bottom with sediment, or fine particles of soil. Sedimentation can smother aquatic organisms and destroy their habitat. The riparian zone is the transition area between the stream edge and the uplands and typically has trees and smaller plants extending outward on either side of the stream. A riparian zone with heavy plant growth may be the best protection, or buffer, against non-point source water pollution. For example, lawn fertilizers can cause problems when washed by rain into a stream. A healthy riparian zone can help absorb the fertilizers before they get into the water. Plants growing in the riparian zone help keep the stream healthy in many other ways. Trees shade and cool the water, which increases the amount of dissolved oxygen the water can hold. Shaded stream segments may be as much as 10 degrees cooler than segments exposed to direct sunlight. Roots help hold the stream banks together, reducing stream bank erosion. Leaves and land insects falling into the water from vegetation on the banks provide organic matter for aquatic food webs. The relatively flat land extending outward on both sides of a stream or river is called the floodplain. 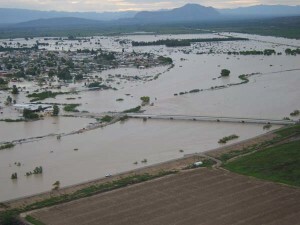 During a flood, the large amounts of additional water overflow the stream banks and spread out to cover the floodplain. (Fig. 8.2) Flooding is a natural characteristic of all streams. By allowing excess water to spread out, floodplains reduce the floodwater’s speed. As a result, less damage occurs in the stream and to areas downstream. People may ignore the natural function of floodplains and build roads and houses in them, resulting in loss of lives and property during floods. (Fig. 8.3) These areas also often contain rich soils best suited to farming. Texas ranks second in the US for biodiversity in its rivers and streams. They are home to more than 250 species of fish, including about 25 non-native species. This great diversity of aquatic life reflects the great diversity of habitats found across Texas’ landscape. 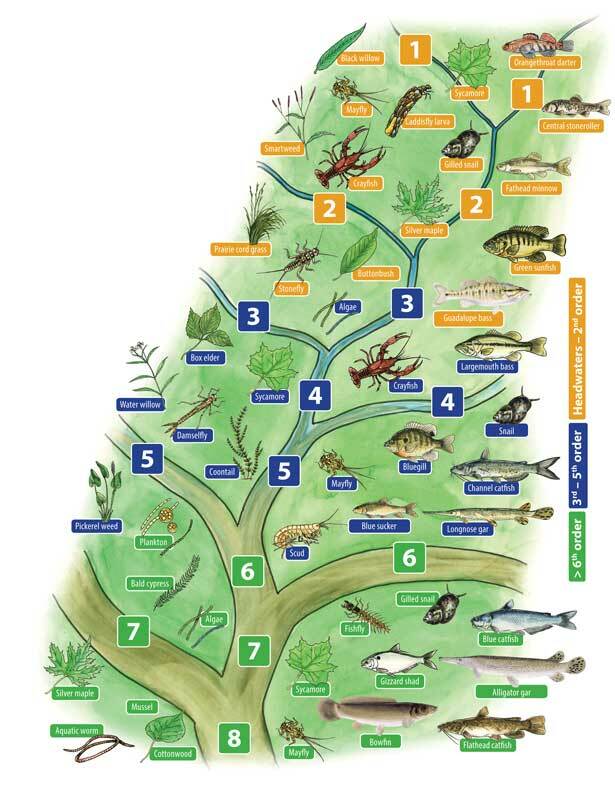 With lots of rainfall in the east and north, East Texas streams have more diverse aquatic communities than streams in arid West Texas. The most common stream fish in Texas are minnows, darters, suckers, sunfish, bass, and catfish. More than 50 species of mussels inhabit Texas rivers. There are also thousands of other species of aquatic invertebrates found in Texas streams. Stream plants and animals have developed special adaptations for life in river and stream habitats. Plants living in moving water have long, thin, flexible stems that offer little resistance to the current, and strong root systems to hold the plants firmly in place. (Fig. 8.4) Mussels burrow in the bottom sediments to avoid the current. Snails use a broad, flat foot to stick to rocks. River otters have an oily coat to keep them dry and warm. Fish such as shiners have streamlined bodies that allow them to remain stable in currents. Catfish and many darter species are bottom dwellers with flattened heads and large pectoral fins angled to help them stay on the bottom in swift currents. Most darters do not have swim bladders allowing them to remain on the bottom of the stream. With these advantages they can stay down low and feed even in swift water. Precipitation first collects at the top of the watershed, in the headwaters of each stream. From there water flows downhill in tiny trickles. As these trickles or runoff begin to combine they first carve out a small stream channel by erosion. This first small stream channel is called a first-order stream. This is a small stream with no tributaries coming into it. First-order streams combine to form larger streams, called second-order streams. These larger, second-order streams combine to form even bigger third-order streams and so on. The Mississippi River’s watershed is the largest in the US and the river is a 10th-order stream when it empties into the Gulf of Mexico. The Amazon River in Brazil is the world’s largest river because it carries more water into the ocean than any other. It is a 12th-order stream when it reaches the Atlantic Ocean. First-and second-order streams. In the headwaters of a stream the water is shallow, the stream bottom is often rocky, and there are few aquatic plants. A lack of food limits the number of animals that can live there. In early order streams the benthic community of organisms, called benthos, is a key part of the food web. These include benthic macroinvertebrates, such as mussels, aquatic insects, and other invertebrates visible without the aid of a microscope. Because there is little aquatic plant growth at the headwaters, animals at the bottom of the food web depend on the leaves, stems, and animals that may fall into the stream from the land. 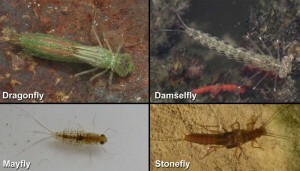 Aquatic insects, such as stonefly nymphs, chew and tear leaves and stems into tiny bits. They are called shredders. Small pieces not eaten by shredders are eaten by filtering and gathering collectors. Grazers (snails, for example) appear further downstream as the channel widens. Here sunlight strikes the stream bottom allowing algae to grow on rocks and plant stems. Grazers feed on the algae. Productivity increases as you go downstream. Food becomes more abundant and diverse, and so does the aquatic community. Most fish that live in headwater streams are small predators such as darters or minnows that are able to hug the bottom and keep from being washed downstream. They feed on smaller animals, such as aquatic insect nymphs and larvae. Since the fish also eat shredders and collectors, they search for areas where there are lots of these kinds of insects. Third- through fifth-order streams. Mid-level streams have both rooted and floating aquatic plants and algae. In these larger streams more types of animals have niches in which to live. Grazers such as snails and water pennies eat the growing number of plants. Collectors increase with the varied plant life. As the plant diversity increases, shredders begin to decrease. A large variety of fish species live in the deeper and more varied mid-level streams. When two streams come together, the waters mix and flow downstream together. Individual characteristics of the streams and nutrients from each watershed combine and form a still larger stream or river. High-order streams. In very large rivers, few rooted plants may grow because the water is too deep and turbid (cloudy). Here, there are more collectors than shredders. 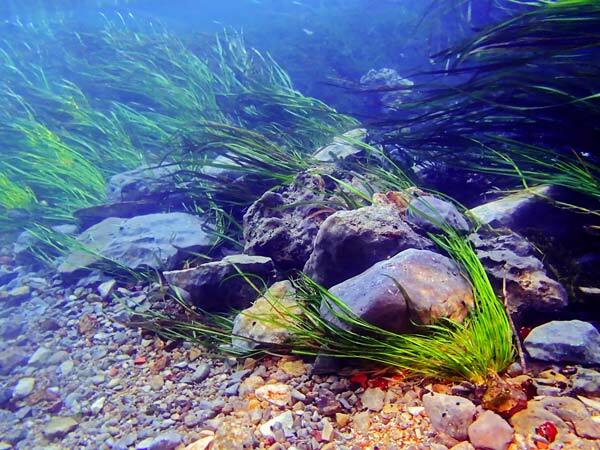 One major group of collectors in big rivers is mussels living in the river’s benthic zone. Fish in large rivers are also an important part of the food web. Catfish species represent a variety of feeding behaviors. Some species tend toward being scavengers, others omnivores or predators. Other fish such as suckers may prey on small mollusks. Predators such as sunfish may specialize in eating insects, while others such as the spotted bass consume smaller fish. Predators range in size from tiny zooplankton to 300 pound alligator gar. Besides testing the physical and chemical characteristics of the water, biologists look for certain benthic macroinvertebrates that live on the stream bottom to tell if the water is good or polluted. Certain species of stoneflies, caddisflies and mayflies are sensitive to pollution, as are certain fish and mussels. The presence of pollution sensitive species generally indicates good quality water. Sensitive species are often called indicator species. When such species are missing from a stream or when only pollution tolerant species such as black fly larvae and bloodworms are present, biologists become concerned. They can then test the water for pollution. High biodiversity of aquatic species and the presence of sensitive species are good signs of a healthy stream. The physical, chemical, and biological characteristics of our rivers reflect Texas’ many geologic, hydrologic, and human influences, especially those associated with city, industrial, and agricultural development over the last century. Whatever is placed onto the land can possibly enter a stream or river through runoff. As a result, many of our streams and rivers have been polluted by harmful contaminants. Today’s laws restrict contamination of Texas’ waters, but pollution of the past still affects some water bodies. Some amount of pollution still enters our waters from accidents or through illegal dumping of contaminants. Sewage from our towns and cities is cleaned in wastewater treatment plants and often released into nearby streams and rivers. This is why it’s important not to use our toilets for getting rid of dangerous materials. In some places treated wastewater can be the majority of water flow in a Texas stream. Aquatic habitats in streams and rivers are affected by local and distant land use practices, channel modifications, groundwater depletion, and changes to stream flows from dams and reservoir operation. Flow in most of the major rivers in Texas is controlled by operation of one or more of the nearly 200 major reservoirs located at some point along a river’s path from headwaters to the Gulf of Mexico. Reservoirs provide flood control, generate hydroelectric power, and supply water to municipalities, industries, and agriculture. These are important uses of rivers that have helped build Texas’ economy. Dams and human use of water from streams also has impacts on aquatic ecosystems. The healthiest streams and rivers are those that flow freely and have natural characteristics. Today few if any of Texas’ many rivers and streams remain completely free flowing or free from non-point or point-source pollution. 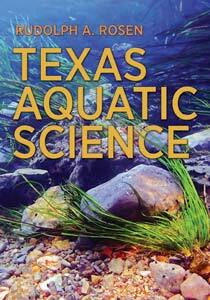 Texas Aquatic Science Streams and Rivers was written and edited by author Rudolph Rosen. Project support came from the Ewing Halsell Foundation and the Sport Fish Restoration Program.